The 2003 Indian Spirit Springfield Edition Motorcycle has an 88'S&S motor with just 8k miles, windshield, sissy bar, front crash bar with highway pegs, indian fender tips, indian tribe dash leather, locking saddle bags, Samson Long Cannon exhaust pipes. 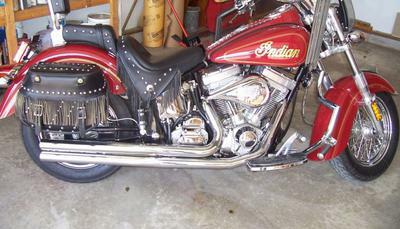 The paint color of the Indian Spirit is a beautiful deep, blood red and she's never been wrecked or down. She's been garage-kept and comes with some accessories at a very good price. If you have any questions regarding the Springfield Edition Indian for sale or if you would like to make an appointment to see it in person or make payment and pick up you can do so using the space below that has been provided by GoGoCycles Used Motorcycles for Sale and PLEASE do not neglect to include your contact information in your email or to provide a phone number or email address so that I can respond with answers to your questions or set up an appointment as quickly as possible. In my opinion there is not a better deal on a beauty as this one in Lakeland,FL Florida or on Craigslist or Ebay so hurry and make an offer before she slips by you! The management at GoGoCycles.com invites our biker friends to write a review of the 2003 Indian Spirit Springfield Edition Motorcycle or share any thoughts and/or opinions to make potential buyers aware of any problems that are commonly associated with this bike or to highlight its positive features and help our visitors make informed decisions. My asking price is a very cheap $8500 or you are welcome to submit a best offer when you call me (leave a message) at 863-815-9684 and don't forget to mention that you found this ad on GoGoCycles Motorcycle Classifieds www.gogocycles.com using the comments forms located on this page.